The Mesothelioma Center at Asbestos.com was a Gold Sponsor of the Pacific Mesothelioma Center’s 6th Annual 5K Walk/Hike for Mesothelioma, helping the event eclipse its fundraising goal of $150,000. 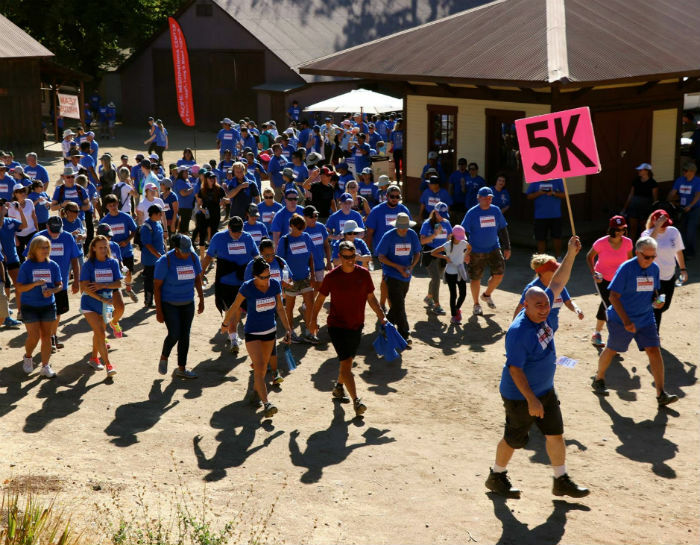 Pacific Mesothelioma Center (PMC) — a division of the Pacific Heart, Lung & Blood Institute (PHLBI) — raised $160,495 with the event, which was held Oct. 22 at the Paramount Ranch in Agoura Hills, California. It is the highest amount raised by the family-friendly walk, surpassing the $122,000 reached in 2016. The goal of the event and PMC is to find better treatment options for malignant pleural mesothelioma, a rare cancer caused by exposure to asbestos. But in addition to raising funds for mesothelioma research, the annual event has become an opportunity for survivors and their loved ones to come together and raise awareness for the asbestos-related cancer. I had the pleasure of attending the event in 2015, and it was an eye-opening experience. The event is very driven by teams, many of which are families affected by mesothelioma. It was my first interaction seeing that many patients. There is an overwhelming sense of camaraderie among the participants. Everyone would create team names and team shirts. It was just really amazing and inspirational to see. Signs denoting facts about mesothelioma are scattered along the 3.1-mile course through the hills of Southern California. At other points, monuments honor those who lost their lives to the debilitating cancer. When I participated two years ago, a family gathered around a monument in memory of their father. They all sat around the monument, which was just off a dirt path, and listened to a song in his honor. That family represented the multigenerational participation at the 5K Walk/Hike for Mesothelioma. It’s not just sons, daughters, husbands or wives. It’s multiple generations of families — from great-grandchildren to spouses. Teams go all out to coordinate uniforms, many of them wearing custom shirts honoring their deceased loved ones. Even sponsors and companies involved show a sense of togetherness with matching outfits. After the walk, a catered lunch brings together families who have never met before. Many of these family members have loved ones who were treated by the same doctors and at the same cancer centers. This event gives them a chance to connect on a deeper level through shared experiences. Mesothelioma survivors also participate. The event gives them an opportunity to show their strength and courage. They can also reunite with many of the people responsible for their survival, such as Dr. Robert Cameron, director of thoracic surgery at Ronald Reagan UCLA Medical Center and senior medical adviser for PMC. This is the third consecutive year The Mesothelioma Center has been a Gold Sponsor of the 5K Walk/Hike for Mesothelioma. We understand how impactful the event is, not just from a fundraising perspective, but from a sense of community and awareness. That’s something that is so unique about mesothelioma events. Because mesothelioma is so rare, there seems to be a more involved participation level and a stronger sense of pride compared to other cancer-related events. The PMC 5K is also the only annual walk on the West Coast that raises funds for mesothelioma research. I attended the 2015 event with my wife, but in the future, I hope we can form our own Asbestos.com team, including Patient Advocates from The Mesothelioma Center, survivors and the many families we’ve helped over the years. One of the biggest takeaways for me was meeting some of those survivors and their loved ones. Being able to put a face to a name or voice is always rewarding and inspiring. Participating in this year’s event was Sal Oliveri’s family. Cameron recently performed surgery on Oliveri. “We are overjoyed that he has been given a shot at extending his life and can think of no better way to show our support of this institute and to help raise funds for their important research program,” Nick Oliveri, Sal’s son, said. It is because of survivors like Sal Oliveri that Patient Advocates at The Mesothelioma Center do what we do. Survivors and those lost to the cancer are also the reason we will continue to support mesothelioma research and sponsor great events such as the 5K Walk/Hike for Mesothelioma.